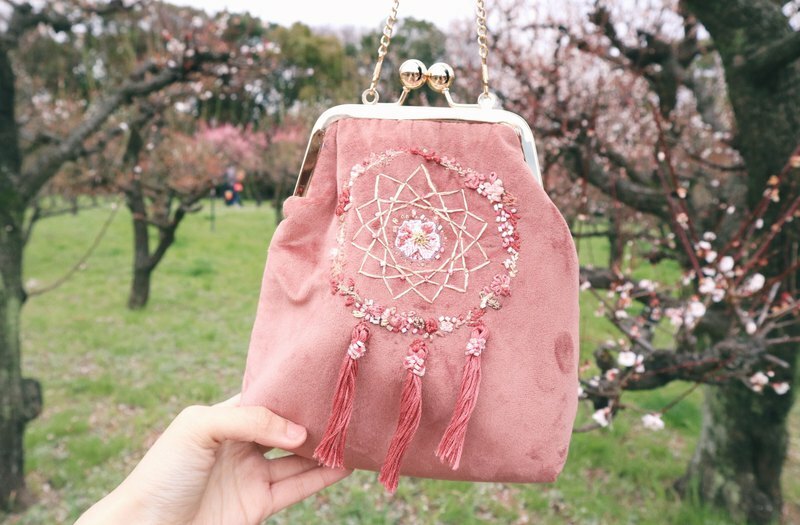 Some flowers are 3D embroidery, & embellish with shiny and tiny beads, an elegant bag is created finally! **Original Design** *100% Handmade*: Making a floral dreamcatcher embroidery	with *DMC Embroidery Floss*, which is made from long staple Egyptian cotton and double mercerized for a brilliant sheen, is the most recommended floss in the world. Moreover, some flowers are 3D embroidery, & embellish with shiny and tiny beads, an elegant bag is created finally! It really takes time to make the bag, **at least 15 hours are needed** for processing. https://c2.staticflickr.com/2/1971/45169838031_91ae3b38a2_c.jpg **Material** Outer layer: Velvet Inner layer: Cotton The bags are *stiff* as there are thick fabric inside both layers. (Please note that the product photos are taken under the condition that nothing is inside the bags) https://c2.staticflickr.com/2/1942/45120817112_f5b900e7c6_c.jpg **Size** Bag(cm): 19(h)x18(w)x7.5(d) Strap: ~105cm For your reference, the girl in the photo is 158cm tall. Please add remark if you would like to adjust the length of the handle. https://c2.staticflickr.com/2/1937/45120811132_7fa7981762_b.jpg There are **a variety of colour options** to meet your requirements. Feel free to contact me if your are interested in other colours. What’s more? A design with your lovely pet is also available! Let’s check it out. https://c2.staticflickr.com/2/1956/45120806672_0a4f700e18_c.jpg Limited stock. Feel free to contact us if you are interested in stock. Please note that *20 working days* are needed for *custom-made order*. **[Important Reminder] Delivery** As the product with protective packaging is quite big, the following delivery method is suggested for an efficient delivery service at low price. For *Hong Kong/ Taiwan/ Mainland China/ Macau* Clients, the product will be delivered by *S.F. Express*. In additional, **please provide the mailing address of industrial or commercial buildings** instead of your home. Otherwise, HKD$35 additional charge is needed. For clients from *other regions*, the product will be delivered by *Hong Kong Post (air mail/EMS)*. Both home and office addresses are accepted.